We thought our earthworks and dugout range could do with some additional protection. 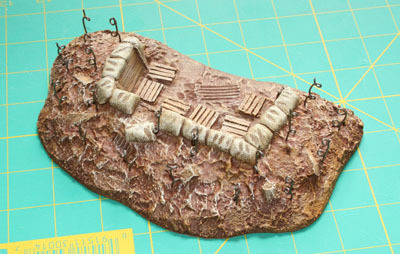 This modelling tip is about adding barbed wire entanglements around a dugout. We have used one of our open sided dugouts, but the technique works equally well any of the other models. 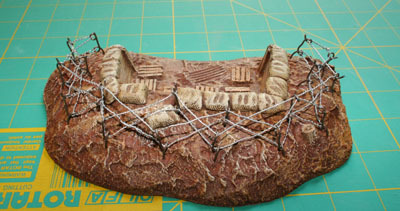 The materials you will need are: a length of barbed wire, 18 picket posts, super glue and needle nose pliers. Fixing the pickets. The first thing to do is to decide where the pickets should go. They are best placed about 30mm apart, and with a double row, about 15mm between rows. This gives a nice look without using too many pickets, or putting them too close together which can make threading the barded wire more difficult. It is best to plan the positions on a piece of paper, especially when the rows are not straight. Draw a template of the dugout and mark where you think the pickets should go. 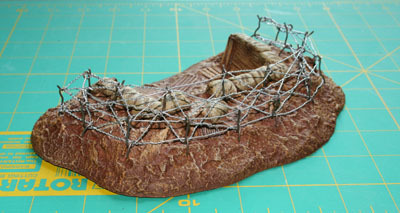 Then mark in the barbed wire pattern. This help ensure that there are the correct number of pickets and that the wire pattern looks right. Once you are happy with the arrangement the pickets can be pushed into the model. 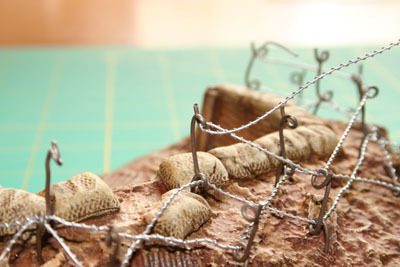 The end of the wire is sharp enough to penetrate the foam, but using needle nose pliers helps stop them bending. For the pickets around the edge the bottom of the wire need to be clipped off as it is too long. Push them into the foam so you can see how much sticks out, and needs cutting off. When all the pickets are in position and trimmed they can be glued permanently. Pull a picket out, apply some super glue to the wire and push back in. The glue will hold the picket firmly in place. Make sure that the loops face inwards as this will help when threading and tensioning the wire. Threading the wire. Once the glue has set the wire can be threaded. We have found that it is best to thread the diagonals on both levels first, starting with the lower level, and then the outside. This makes getting access to the picket easier. We have also found that for the diagonals it is easier to thread all the wire through each loop one at a time, rather than trying to thread it through all the loops and pull from one end. It is also easier to use several shorter lengths – up to about 30cm – rather than one very long piece. Tensioning the wire. 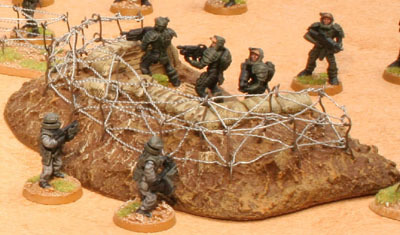 To make the barbed wire look natural it need to be slightly tensioned. The model wire is stiff enough to hold straight, but some care needs to be taken where the wire bends. Once a length wire had been threaded through a loop straighten out any kinks or sagging. Then bend it back upon itself, or at a sharp angle, where it would change direction at the loop. This helps the wire stay in the correct position on the picket and gives it a "stretched" look. Once the whole length has been treaded, but before "tying it off" check the wire is running correctly between the picket loops and that the pickets are in the right position. Bend back any that are out of position and realign the wire. Once everything looks OK tie off the wire. This is best done by bending it back on itself at a loop and giving is a couple of twists around itself. Make sure there is enough wire for this and trim any excess. The pliers are very useful for this stage. It can be worth while to estimate the length of wire to get to a particular picket. Also, because the loops will only take so many strand of wire, try not to have too many joins at one loop. Once tied off check the pickets and the wire, adjusting the pickets to get the tension and positions right. Be careful not to tension either row of wire too much, as this will bend the pickets over towards each other. It is worth checking as you go to make sure this is not happening.